Hey everyone, today I’m sharing my online shopping experience with Plumgoodness.com. 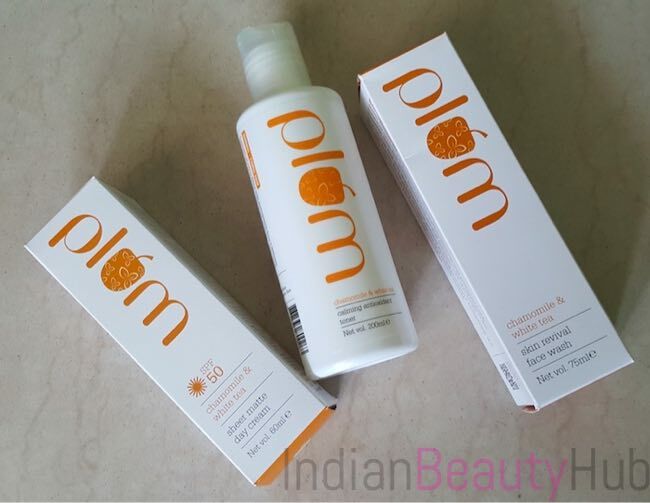 Plum is India’s first online-only beauty brand that offers a range of 100% vegan skin care & body care products. Plum beauty products are free of Parabens, Phthalates, Propylene Glycol, SLS, DEA & PABA and are not tested on animals. One more reason why I like Plum brand is that they don’t make fairness or skin whitening products. Recently I ordered their newly launched Chamomile & White Tea range products (face wash, day cream & toner) and really liked them. Plumgoodness.com has a very neat layout with a user-friendly interface. Different categories with filters and search option make shopping experience much more convenient. 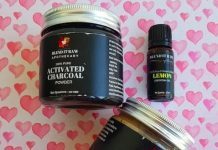 Order placement was very easy with Plumgoodness.com. I registered myself at their website by entering my email id and password. 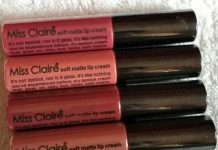 Next, I chose the products and added them to the cart. After that, I entered my address and made payment. They sent the order confirmation email on the registered email id and SMS on the registered mobile phone. They offer free shipping for order value above Rs.299 and charge flat rate of Rs.99 for orders below Rs.299. Payment can be made via debit/credit cards, net banking, and PayU Money. COD option is also available in most locations. They deliver to almost all major towns in India through Blue Dart, FedEx, Aramex, Delhivery, Ecom Express & DTDC. I received my package within 4 days in Delhi NCR. They also offer discount deals on every purchase. You will earn Plum Reward Points on every purchase that you can redeem in your next purchase. They offer a wide range of face cleansers, creams, face masks, toners, sunscreens for every skin type – normal, oily, dry & even sensitive. They use only recyclable containers and avoid the use of PVC, ABS and SAN in packaging. 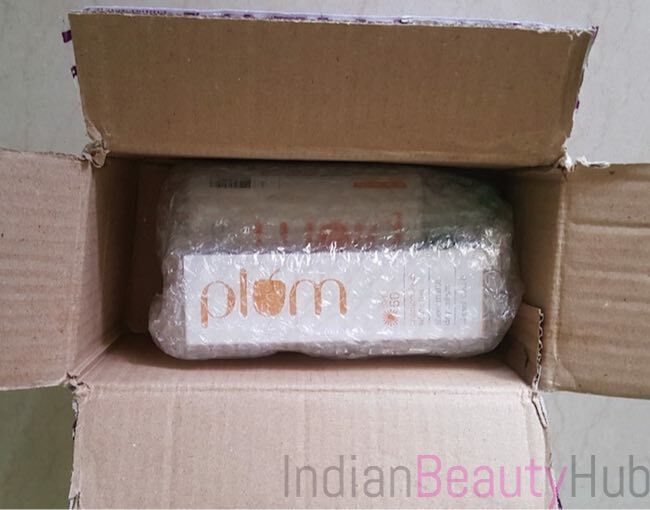 All the products were nicely bubble wrapped and placed inside a sturdy carton. Overall I had a great shopping experience @ Plumgoodness.com. I will definitely order a few more skincare products from their website. 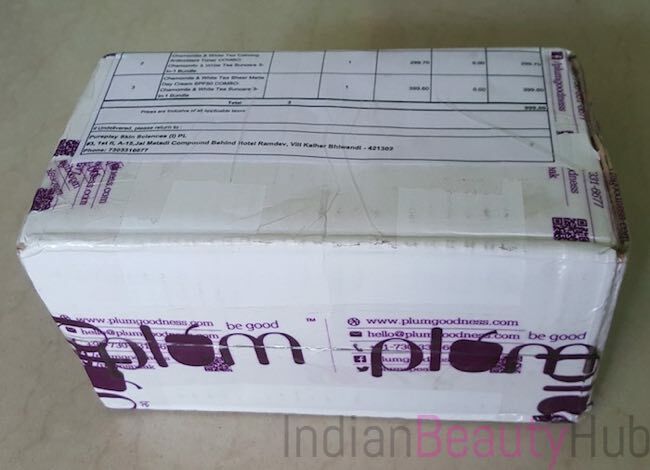 If you are planning to buy Plum beauty product then you should definitely check out their online website. Highly recommended!